Home / News & Events / News & Events / Our isandbox has arrived! Lochaber Geopark is proud to announce the instalment of our new iSandBox, sponsored by Breedon Group. 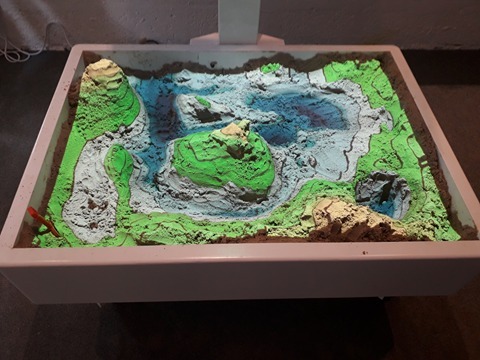 This is new and exciting visual technology whereby children can see an interactive projection onto sand of lakes, rivers, ice, contours, volcanoes and more. It incorporates science learning and creativity and is very engaging. Two other places in Scotland that have this equipment are Aberdeen Science Centre and Dundee Science Centre. At the Geopark we are proud to support Science, Technology, Engineering and Mathematics (STEM) learning and have a STEM ambassador in our workplace. We recently sponsored the successful first Primary STEM Fair, which featured a geological workshop and was organised by one of our board of directors, Emily Brown. On Wednesday 7th June we invited the local Brownies to come and see the new technology and use it to help us teach them about STEM and women working in Science. The night featured: landscapes of Lochaber, running rivers, formation of glaciers, season changes and rock stacking. Children begin to understand Science at nursery level and recent studies in education show that they may have chosen their career by the age of 11. We are keen to promote the possibility of raising their sights and opening the door to better opportunities by learning more about Earth Sciences and making learning about them accessible to everyone. Please come in and visit the new iSandBox! We are open 10am – 4pm Mon – Sat at 55A Fort William High Street. The facility to be able to provide more education about Science to those who may not be able to access it otherwise is very important to us.